Right now we have a thread open talking all about a way to download and update your Xbox dash to the new NXE build with out Xbox Live and after looking it over i must say it sounds easy enough to do so i have the full info, layout and links below. * A DVD or CD burner. * A blank, writeable DVD or CD. * The update file from Xbox.com. This procedure involves burning the DVD or CD by using Microsoft Windows DVD or CD burning software. If you're using third-party CD/DVD writing software, follow the instructions for creating a data disc. The same steps apply whether burning a CD or a DVD. 1. Click here to begin downloading the update folder. Save it as "$SystemUpdate_Fall08.zip" anywhere on your computer. 2. Place a blank disc in your burner. From Windows Explorer, select Open Writable CD Folder Using Windows Explorer or open the CD drive icon. 3. Open (double click) the zipped $SystemUpdate_ Fall08.zip folder and drag the contents of the zipped folder to the root of the CD Folder. If the CD write window doesn't open by default, drag and drop the folder onto the CD/DVD RW drive. If you are using an earlier version of Windows you will need to open the file using a separate utility (for example, WinZip). 4. In the Explorer window, click Write files to CD from the CD writing tasks or right-click the CD/DVD RW drive and select Write these files to CD. The update filename and folder structure must be intact for the update to run properly. 5. Follow the steps in the CD wizard. When you are finished with the wizard, the CD will eject. Your CD is ready. 1. Place the CD in the Xbox 360 console. 2. Power cycle the Xbox 360 console. 3. The update program will start automatically. Select Yes, update now and press A. 4. Wait for the update to complete. 5. When the console reboots, you're done. [$SystemUpdate_ Fall08.zip]. © 2008 Microsoft Corporation. All rights reserved. 360-Hq.Com Official Topic: GOOD NEWS GUY'S NXE update!!!!! XviD & Divx coming to Xbox 360? It would seem Microsoft have announced at an event in Rotterdam called Mission 360 that there will be a firmware patch coming out in the next few months that will address the lack of support for these very popular video formats. Also noted was that Microsoft want to release the Xbox 360 in a variety of new colours. Which is all well and good but I feel a little to late as i'm surely not going to go out and buy a new console just for a colour change. Bungie developer's have mentioned that work is progressing on new maps for Halo 3. Frank O'Connor "Work is progressing on new maps for future downloadable content, with the design and art teams vigorously engaged in the process. More entertainingly however, the ad-hoc test team of Bungie staff is enjoying these new maps greatly. My favorites are what I have already nicknamed Jodrell Bank and Moonbase Alpha. I “invented” a game type on Jodrell Bank which is actually just Team Slayer with Swords and Snipers. Thanks to some unique geographical features of that map, it works great. Moonbase Alpha, on the other hand is best suited to objective games, like CTF and Assault, but it has some natural deadlocks that make Slayer interesting and Infection terrifying. Which reminds me of one more downloadable map. The scariest map of all time. Dark, frightening and surprisingly enormous. One of the scariest things that has ever happened to me (and this in a lifetime fraught with terror) was racing away from a marauding gang of zombies in Infection atop a Mongoose, only to have one leap out of the darkness ahead and unseat me with a throaty scream. I call that level John Carpenter’s Prince of Dorkness. It’s not as catchy as Jub Jub, but it’s every bit as accurate." There is no word when we will all be seeing this new downloadable content for Halo 3 but with internal teams already testing the new content it hopefully won't be long. KrK / Team 360h released a new version of ISO2GOD with full support for Windows and Linux. "ISO2GOD" is a pc tool used to convert Xbox 360 and Xbox 1 ISO images into Games on Demand containers, removing the need for a DVD drive. This app now comes in two variants, one with an installer to things a bit quicker for Windows users and one without an installer for Linux users. If you intend to use Iso2God on Linux you'll need to install Wine and Mono. This release fixes a bug with the generation of CON headers where the Media ID has not been written correctly. If you run GODs from NXE this isn't an issue, but it will break the automated TU downloader in FSD when used on GODs. XexTool v6.0 is now bundled to support reading details from newer XEXs. - Media ID now written to CON header correctly. - XexTool v6.0 now included to support newer XEXs. The wonderful team over at Kontrol Freek, recently gave us a chance to test out their new products FPS and Speed Freek. While we’ve had a solid month to test out their products we’ve given each of them a solid 25 hours plus for each, so we know how well each of them works. I’m going to take this chance here to thank all of Kontrol Freek now for giving us this chance to review their products. Now on to the review! XCM have just recently announced that the "XCM Cross Fire Converter" for the Xbox 360 is near completion and 360-HQ have all the latest info. The XCM Cross Fire Converter allows you to use your PS3 Controller on your xbox 360. 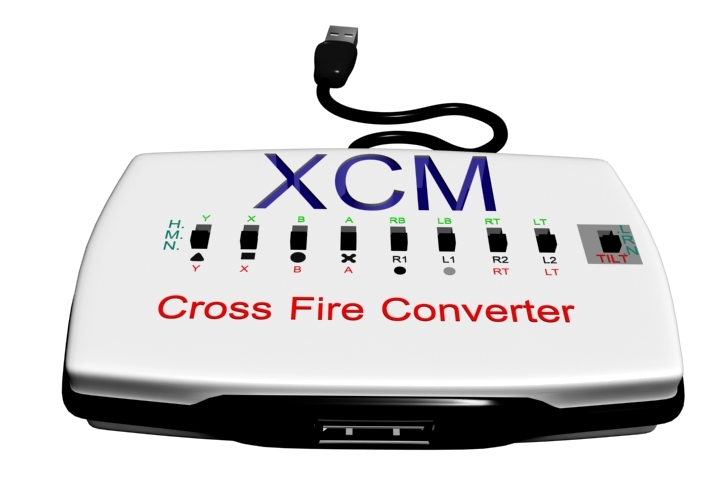 The "XCM Cross Fire Converter" boxes are currently being printed and these should start making their way to distributors within the next 7-14 days. Enjoy the pic and description. 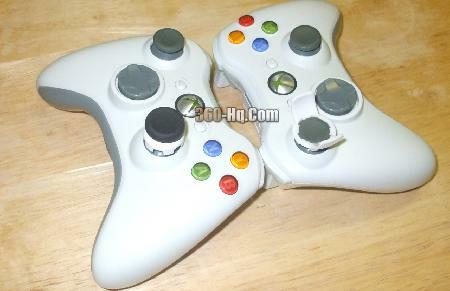 The "XCM Cross Fire adapter" lets you connect your PS3 controller to your Xbox 360 console. With built in rapid fire / turbo, forced feedback support, and tilt functions this adapter is the ultimate in Xbox 360 accessories. This adapter is also compatible with the Xbox 360 and Original Xbox wired controllers for added Rapid Fire / Turbo functionality. Use your Playstation 3 controller on your Xbox 360 console. Enables Rapid Fire / Turbo on Wired Xbox 360 and Original Xbox controllers when connected to your Xbox 360 console. Supports Forced Feedback on PS3/Xbox 360/Xbox controllers. Supports 2 stick analog tilt functionality of the PS3 controller on the Xbox 360. Must be used in conjunction with a Wired Xbox 360 controller. Before connecting your controller to the XCM Cross Fire adapter, the XCM logo (LED) will change to green, red and blue in sequence until your controller is plugged in. Once the controller is plugged in the LED will change to: Green - Xbox 360 Wired Controller, Red - Original Xbox Controller, Blue - Playstation 3 Wired Controller.